It would be suicidal to threaten Saraki, Dogara – Osinbajo – Royal Times of Nigeria. Acting President Yemi Osinbajo said it would be suicidal to threaten Senate President Bukola Saraki and Speaker Yakubu Dogara. Osinbajo said this while declaring open the 16th Conference of Speakers and Presiding Officers of the Commonwealth (CSPOC) in Abuja on Tuesday. 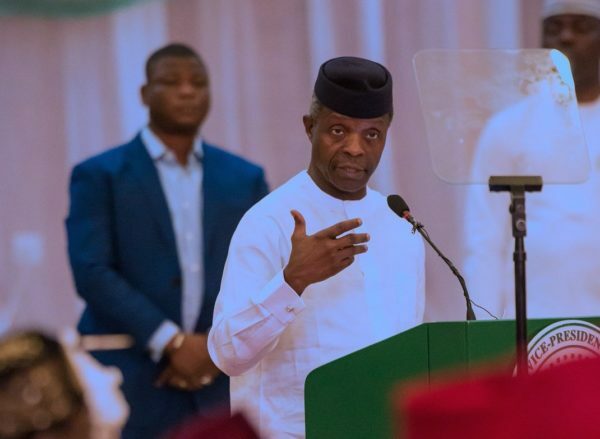 Osinbajo said the media was more interested in the disagreements between the executive and legislature, instead of the harmonious relationship. He said: “On a lighter note, I don’t know the experiences of presiding officers from other nations present here on the relationship between the Executive and the Legislature by the press and the social media. “Here in Nigeria, what makes news is conflict between the Executive and the Legislature. The more dramatic is it, the more newsworthy it becomes. “If you follow things in the media, you’ll be confronted by the exclusive and breaking news stories, reporting several different issues of conflicts between the Executive and the Legislature. “Now, if you see the combined sizes of the Senate President and the Right Honourable Speaker compared to mine, it’ll be a suicidal to threaten either of them let alone the two of them,” Osinbajo said jokingly.